I have gotten a bit behind in posting recipes, since Ham and Cheese Stuffed Chicken Cutlets was the first recipe I tried from Just in Time, Rachael's newest cookbook. This recipe can be summed up as a lightened up version of Chicken Cordon Bleu. This is one of the 15-minute meals from the book, but it was tough for me to figure out exactly when it was done. Since it was stuffed with ham and cheese and because I don't think I made them thin enough, they took longer than they probably should have. I also cut one open to make sure it was cooked through (which it wasn't). Once it was cooked through, this was a great spin on the average chicken meal. You can use them to help you out of the good old chicken rut and even get some veggies in there to boot. I also made my old favorite Chili-Garlic Roasted Broccoli. [This paragraph explains how to butterfly the chicken breasts.] Line up the chicken breast pieces on a work surface with the pointed ends closest to you. Place your hand flat across the top of each breast and use a sharp knife to cut horizontally into the meat, working your way down to teh ip end; do not cut all teh way through. You just want to be able to open up the breast like a book. Cover the butterflied breasts with plastic or wax paper and gently pound out to 1/4 inch with a small skillet; a couple of gentle whacks will do it. Preheat a large skillet over medium-high heat with 3 tablespoons of EVOO, 3 times around the pan. Combine the chopped thyme with a couple of teaspoons of lemon zest and the parsley. Sprinkle the inside of each chicken breast with the thyme-lemon zest-parsley mixture. Add a folded slice of prosciutto cotto or rosemary ham and Fontina cheese to each, then fold up the breasts again. Season the stuffed chicken on both sides with salt and pepper. While chicken cooks, bring 1 inch of water to a boil in a skillet. Salt the water and cook asparagus for 3 to 4 minutes, until just tender. Drain and dress with the juice of 1/2 lemon and a drizzle of EVOO. 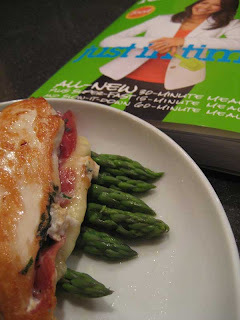 Arrange a few spears of asparagus on each dinner plate and top with a stuffed chicken breast. Spoon some of the pan juices over each serving. The chicken looks divine = a must for supper some time.